Part TWO of "Center Court: A Half-Century of Trends Meet At The Mall," a paper I wrote last spring about one of my great loves - the shopping mall. Look for cameos from some of your favorite East County palaces of commerce! Click here for part ONE. Urban renewal projects like the Inner Harbor in Baltimore was considered a way for mall developers like James Rouse to expand into under-served markets when traditional malls were no longer viable. By 1978, Time magazine declared there was “a pall over the suburban mall” as over twenty years of mall development quickly came to a halt. That year, only twenty malls were completed nationwide; by 1980, there would only be nine. The energy crisis a few years earlier had made developers reconsider the ridiculously high heating and air-conditioning bills demanded by an enclosed mall; meanwhile, customers, already discouraged from shopping by inflation and high unemployment, were increasingly unwilling to drive long distances to regional shopping malls. Plummeting birth rates meant closed schools, deserted cul-de-sacs and, most importantly of all – empty mall food courts. White flight from inner suburbs to outer suburbs sent many older malls into decline, and as population growth caught up with mall expansion, newer centers were threatened as well. As a result, many communities became increasingly wary of shopping malls. Burlington, Vermont, a small city near the Canadian border, caused a national stir when it fought tooth-and-nail to keep developer Pyramid Companies from building a mall in neighboring Williston. Pyramid, which had almost single-handedly saturated the retail market in New York, was forced to drop their plans when a Vermont environmental commission argued that the proposed mall would affect “the entire social fabric” of the region. Meanwhile, in cities still reeling from the race riots a decade earlier and hemorrhaging population, the mall seemed like a last-chance opportunity to lure people downtown again. James Rouse – who had first pioneered the enclosed mall with Harundale – was at the forefront of the movement to build urban malls. 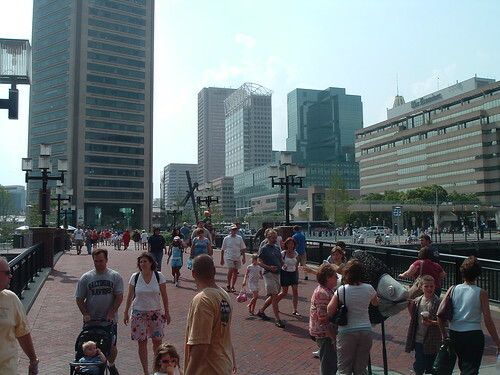 The Rouse Company’s biggest success was Harborplace, located in the Inner Harbor of Baltimore and considered the catalyst for the city’s revitalization upon its opening in 1980. Harborplace fulfilled Rouse’s ideal that "the only legitimate purpose of a city is to provide for the life and growth of its people." In 1981, he appeared on a Time magazine cover next to the phrase “Cities Are Fun!”, which succinctly explained his personal sentiment, but the nation as a whole was still moving away from the city and towards something new. By the 1980’s, the “edge city” had overtaken downtown in both job and retail growth. There were two hundred edge cities in the United States by the end of the decade, and each one was larger than downtown Memphis. 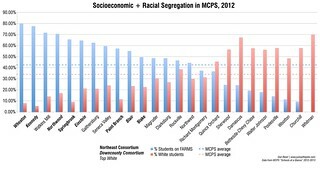 Twenty of these were in the Washington-Baltimore area alone. Success was likely, but not guaranteed for malls that located or were already located in an edge city. These were places that businesses had chosen to set up shop in because of their easy access to existing residential areas in addition to airports, other job centers, and downtown itself. These are the places where malls were usually very popular, had large, dedicated consumer bases – a quarter-million people within a fifteen-minute drive was the ideal – and where malls would have to start expanding in order to take advantage and stay relevant. Smaller shopping centers, like Virginia Center Commons outside Richmond, Virginia, were drained of shoppers and business by larger, more extravagant malls that could draw from a regional consumer base. The enclosed shopping mall, which used up obscene amounts of energy, occupied hundreds of acres of land, and was occupied by the branches of nationwide chain stores, was now only useful on a level more befitting its scale: as a regional destination. Smaller malls like Harundale – still trapped in its 1950’s state – failed, lacking enough attractions to serve a large area and without any room to expand. In 1997, it was finally torn down and replaced with Harundale Plaza, a strip mall. Even larger malls like Tysons Corner Center, now twenty years old, had to adapt to changing times and changing mall tastes. In 1988, Tysons added a Nordstrom department store and a second level; with over two million square feet of retail space, it was now nearly double the size of nearby malls, putting it in a exclusive group of new, “super-regional malls” like South Coast Plaza and King of Prussia Mall. Across the street, a strip shopping center that formerly had a K-Mart was transformed into a “luxurious, mixed-use complex” with new tenants including Neiman Marcus and Saks Fifth Avenue. 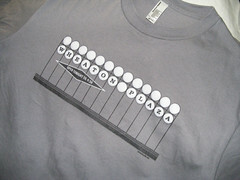 It was called Tysons Galleria, or Tysons II to locals. Between the two malls, there were now well over three million square feet of retail space in the same location, vaulting Tysons Corner over downtown Washington, D.C. as the shopping hub not only for the metropolitan area but for the entire Mid-Atlantic region. This store at Tysons Corner Center in Northern Virginia is set up to look like the outside of a Greenwich Village apartment. In order to serve hundreds and thousands of shoppers – the population of a decent-sized city – the mall now had to become as diverse as a city, responding to the splintering of mainstream culture by providing stores for any number of different tastes. “The mall, like the city, is capacious,” writes Paco Underwood in Call of the Mall. It “serves any number of subcultures and even sub-subcultures simultaneously." Like a city street, the corridors of the mall were becoming lined with increasingly varied façades, reflecting the different images a store would try to sell its audience. With such a large consumer shed, malls were guaranteed that a store modeled after a California beach bungalow, a Greenwich Village apartment, or an Adirondacks sporting goods store would all be successful. In fact, all three chains are owned by the same company – Abercrombie and Fitch – and appear together in a number of malls, including Tysons Corner Center. One of the first stores to take advantage of this branding technique was Pacific Sunwear, which opened in 1981 and traffics in the California surf and skate scene. Seven years later, it was joined by Hot Topic, the “much maligned yet hugely influential (and ageless)” store aimed at fans of everything from punk rock to Japanese anime. 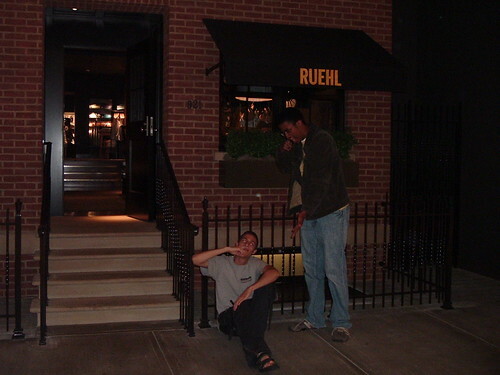 It is perhaps best known for its exposed-brick-and-red-neon décor, calling to mind an underground city club. The main clientele of all of these stores are teenagers, the very same who, a few decades earlier, had nowhere to go and, more importantly, a ruthlessly conformist suburban culture that gave youth “an emotional emptiness” and “stunted creativity." While all of these stores, particularly Hot Topic, have their detractors, they – and the malls that allowed them to open – gave suburban youth an entrée into a world outside of the cul-de-sac. The ubiquitous Hot Topic, shown here at the Coastal Grand Mall in Myrtle Beach, South Carolina, creates the feel of an underground city club. Meanwhile, affluent, time-starved consumers were finding trips to the mall for minor purchases inconvenient. It was no longer practical for a shopper to fight traffic to drive to the mall, find a parking space, and go down a corridor past several stores he or she does not want to visit to reach the store they want, regardless of Taubman’s or any other developer’s intentions to make them stay. At the same time, the sense of civic pride that had once existed in the small towns and large cities of America had all but eroded with forty years of explosive suburban growth. Malls, many of which did have public meeting spaces and held community events, were still privately owned and were not always willing to accommodate patrons who were not, after all, there to buy something. Only a handful of enclosed malls were built during the 21st century; in 2006, just one mall opened – Jordan Creek Town Center, located in West Des Moines, Iowa. The mall as we know it had split, going into three different directions to serve the different needs of modern suburban consumers. 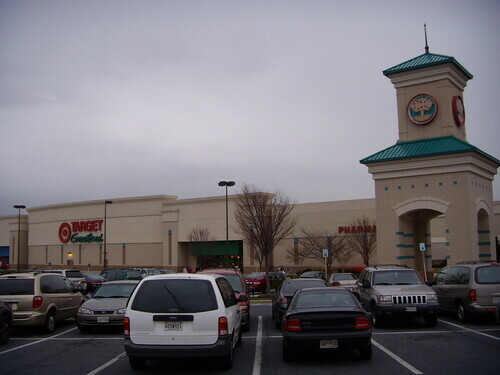 With "big-box" stores like Target, Staples and Petsmart, Orchard Center in Silver Spring, Maryland is considered to be a "power center." 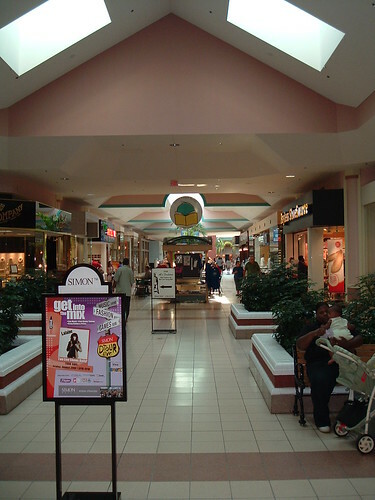 The super-regional mall was one example of the mall’s split, giving consumers a place to go when they actually wanted to shop and had a day or at least an afternoon for it. At the other extreme, serving shoppers who had little time to purchase things, there was the power center, or “big-box” center, the first example of which is 280 Metro Center in Colma, California, located in an edge city just outside of San Francisco. It is contained almost solely of anchors, so-called “category killers” such as Home Depot and Best Buy that deal exclusively in one department, dominating it and threatening their mom-and-pop counterparts, lined up in a row. These complexes often rival regional malls both in floor space and in land acreage. Each store has its own parking directly in front, allowing shoppers to drive up, get what they need, and leave. The only aesthetic difference between it and a normal strip mall is the scale, but their effect on existing retail is huge. “In the face of the big boxes’ aggressive expansion,” writes Dolores Hayden, “local drugstores, stationary stores, clothing stores and hardware stores have disappeared by the tens of thousands,” permanently altering the communities they locate in. Providing a wide variety of goods at low prices, power centers have become the preferred main shopping destination for many suburbanites. 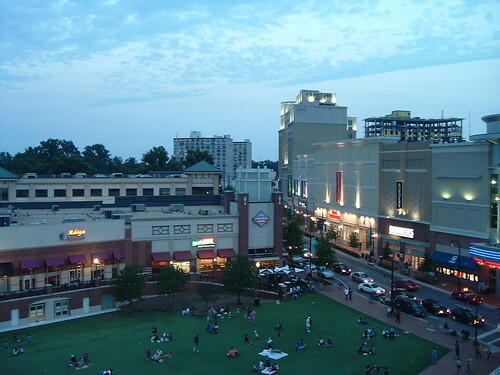 The Downtown Silver Spring complex, located in downtown Silver Spring, Maryland, exemplifies the current "lifestyle center" trend. On a completely different plane from the mall and the power center is the “lifestyle center,” which sought to bring back the “town” back into the “town square” that malls had reputedly become. The first lifestyle center, the Shops at Saddle Creek, opened in Germantown, Tennessee in 1987. It, like most lifestyle centers, was “designed especially with the upper-income shopper in mind, ample sidewalks, parking adjacent to stores, entertainment facilities, and upscale restaurants and shops” according to a study on lifestyle centers from the Maryland-National Capital Park and Planning Commission. While Saddle Creek was little more than a few small strips arranged next to each other, the lifestyle center would evolve into a “mini-downtown” for suburban areas, both in form and use. As of 2005, there were 132 lifestyle centers in the United States. Downtown Silver Spring, a complex one mile from the Washington, D.C. line in Maryland, exemplifies the lifestyle center standard: shops front onto actual streets, albeit privately-owned ones; parking is easily accessed but tucked away in parking garages, or behind shops; plazas and squares are located throughout for lounging and people-watching; and entertainment facilities, such as movie theatres and bookstores, are a standard feature. At 450,000 square feet, it is less than half the size of a typical enclosed mall. Yet looking at the massive crowds that appear on a Friday night, it’s clear that Downtown Silver Spring is thriving, even as the corridors of neighboring City Place Mall, a relic from the urban mall movement, remain empty. A half-century after Southdale and Harundale, the enclosed shopping mall lives on, yet in a wildly different context. After supplanting downtowns forty years ago, today’s shopping malls are becoming downtowns in their own right. In Tysons Corner, there is a plan to turn the business district, now larger than Atlanta’s, into a real city with tree-lined boulevards, thirty-story towers, and four stops on the Washington Metro subway. It sits at the center of the nation’s third-wealthiest county and next to its first-wealthiest, between two international airports and, of course, it is just a short drive away from the capital of the free world. Of all of the malls built in all of the towns over the past half-century, Tysons Corner has become an unparalleled success as it has grown and adapted to changing times and tastes. Meanwhile, fifty miles away in Glen Burnie, a shopping cart still waits by the entrance of Harundale Plaza, a shopping center that, while given a new lease at life, will never inspire happiness the way its predecessor had. Harundale was a time capsule, a look at the history of the shopping mall, a history so important only because the constantly-evolving mall cannot let its shoppers know one exists. While not original to America, the shopping mall has become an American institution, one as diverse as our society and varied from place to place. As long as the mall, in whatever form, remains our “town center,” it may become the only place to sample local flavor, if only to see what indoor springtime feels like during a Minnesota winter or Arizona summer. Just a detail to correct in this excellent piece. Malls didn't have food courts in 1978. The food court was more or less invented by Boston's Faneuil Hall Marketplace (which wasn't originally intended to sell fast food, but quickly evolved in that direction) and then more intentionally at Harborplace in Baltimore. Good to know I'm not the only one fascinated by consumerist history. I'm even contemplating going for a MA in American Studies just so I can have an excuse to read more about it! Check out deadmalls.com if you haven't already. It's loaded with (mostly user-contributed) profiles of malls gone or teetering on the brink - including Landover Mall, Laurel Mall, and Capital Plaza. Ah, Capital Plaza Mall. When I was a young lass (in the 70s) we would attend their July 4 fireworks every year.